We listen, we select options, and create what you love. If you are considering framing a valuable heirloom, a unique work of art, or a fabulous photograph from your last vacation, visit our framing studio and gallery. We are conveniently located in beautiful, Asheville, North Carolina, in Reynolds Village. We specialize in museum, conservation, textile and shadowbox framing, offering over 40 years of custom framing experience. All framing is done onsite with attention to detail and priced competitively. Shadowboxes are a wonderful way to create an heirloom to be passed down through generations. Organizing mementos for an appealing shadowbox is a process. I sometimes work with the customer to create the arrangement or, after conferring with the customer, I will design the arrangement always considering color and balance. Studio B also features original work by regional, national and international artists. Exhibits rotate throughout the year creating a stimulating environment showcasing work ranging from oil and acrylic paintings, pastel drawings and ceramics to jewelry, sculpture and woodworking. We have a selection of posters, prints and fine art reproductions on hand and can special order on request. 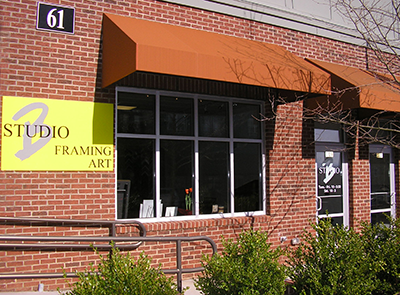 Studio B Custom Framing & Fine Art was established in 1981 by Patti Bell in downtown Lancaster, Ohio after 10 years of employment as a custom framer in Columbus. Patti came to be known as the top framer in Central Ohio and is known across the country for her attention to detail. Her clients include many museums, artists, galleries and private collectors from Connecticut to California. Our mission is to provide the finest craftsmanship in custom framing. We strive to build long term relationships with our customers and offer the utmost in customer service. From our former location at 171 Weaverville Rd. go south to the first light & go left onto Senator Reynolds Rd. After the 4 way stop, the first building on the left, suite 109. From I-26, go straight thru the light, up the hill to the 4 way stop, first building on the left, suite 109. From the Woodfin YMCA, 2nd building on the right after the 4 way stop. Studio B © Copyright 2019. All Rights Reserved.